Hydrazine sulfate is the salt of hydrazine and sulfuric acid. It is a white, water-soluble salt of the cation hydrazinium and the anion bisulfate, giving the formula (N2H5)HSO4. It is prepared by treating an aqueous solution of hydrazine with sulfuric acid. It has a number of laboratory uses in analytical chemistry and the synthesis of organic compounds. Hydrazine sulfate is used as a precursor to hydrazine. For some applications, this salt is preferred over pure hydrazine because it is nonvolatile and less susceptible to atmospheric oxidation on storage. These same properties make it the preferred form of hydrazine for dietary supplements and pharmaceutical trials. It is relatively inexpensive, with 100 grams of analytical grade hydrazine sulfate costing about US$20, and 100 tablets or capsules (60 milligrams hydrazine sulfate) costing US$20 to US$60. Hydrazine sulfate also has a variety of uses in the chemical industry. This salt once attracted attention for its alleged medicinal properties. The salt is prepared by oxidation of ammonium sulfate with bleach. Hydrazine sulfate is purified by recrystallization from water. If free base hydrazine is available, its solutions react with sulfuric acid to give the salt. Known by the trade name Sehydrin, it is a chemical compound that has been used as an alternative medical treatment for the loss of appetite (anorexia) and weight loss (cachexia), which are often associated with cancer. Hydrazine sulfate has never been approved in the United States as safe and effective in treating any medical condition, although it is marketed as a dietary supplement. It is also sold over the Internet by websites that promote its use as a cancer therapy. The active ingredient is hydrazine, and the sulfate component is present to aid in formulation. The main proponent of hydrazine sulfate as an anti-cancer agent is a U.S. physician named Joseph Gold, who developed the treatment in the mid-1970s. The use of hydrazine sulfate as a cancer remedy was popularized by the magazine Penthouse in the mid-1990s, when Kathy Keeton, wife and business partner of the magazine's publisher Bob Guccione, used it in an attempt to treat her metastatic breast cancer. Alternative medicine nutritionist Gary Null wrote three of the articles about alternative cancer treatments, including one titled "The Great Cancer Fraud." Keeton (until her death in 1997) and other supporters of hydrazine sulfate treatment accused the U.S. National Cancer Institute (NCI) of deliberately hiding the beneficial effects of the compound, and threatened to launch a class action lawsuit. The NCI denied the claims, and says that there is little to no evidence that hydrazine sulfate has any beneficial effects whatsoever. The position of the NCI was supported by an inquiry held by the General Accounting Office. A review of the clinical research concluded that hydrazine sulfate has never been shown to act as an anticancer agent; patients do not experience remissions or regressions of their cancer, and patients do not live longer than non-treated patients. Some academic reviews of alternative cancer treatments have described the compound as a "disproved and ineffective treatment for cancer". Hydrazine sulfate also has a variety of uses in industrial chemistry, including as a chemical intermediate, as a catalyst in making fibers out of acetate, as a fungicide, antiseptic, in the analysis and synthesis of minerals and testing for arsenic in metals. Hydrazine sulfate was specifically developed as a result of a proposal by Joseph Gold for a therapy that could offset the rapid loss of weight that occurs in cancer (cancer cachexia). This hypothesis was based on the fact that cancer cells are often unusually dependent on glycolysis for energy (the Warburg effect), Gold proposed that the body might offset this increased glycolysis using gluconeogenesis, which is the pathway that is the reverse of glycolysis. Since this process would require a great deal of energy, Gold thought that inhibiting gluconeogenesis might reverse this energy requirement and be an effective treatment for cancer cachexia. Hydrazine is a reactive chemical that in the test tube can inactivate one of the enzymes needed for gluconeogenesis, phosphoenolpyruvate carboxykinase (PEP-CK). It was also postulated that if tumor energy gain (glycolysis) and host-energy loss (gluconeogenesis) were functionally interrelated, inhibition of gluconeogenesis at PEP CK could result in actual tumor regression in addition to reversal or arrest of cancer cachexia. In this model, hydrazine sulfate is therefore thought to act by irreversibly inhibiting the enzyme phosphoenolpyruvate carboxykinase. Joseph Gold, the developer and principal proponent of hydrazine sulfate, has published several papers arguing that the compound is an effective cancer treatment. These data have been questioned by the American Cancer Society and other investigators have been unable to repeat or confirm these results. Gold is reported not to trust the motives or results of other investigators, with CNN quoting him as stating that "they've been out to get hydrazine sulfate, and I don't know why". In response to these results, an uncontrolled clinical trial was carried out at the Petrov Research Institute of Oncology in St. Petersburg over a period of 17 years, and a controlled trial was carried out at the Harbor-UCLA Medical Center in California over period of 10 years, respectively. The Russian trial reported complete tumor regression in about 1% of cases, a partial response in about 3% of cases and some subjective improvement of symptoms in about half of the patients. The National Cancer Institute analysis of this trial notes that interpretation of these data is difficult, due to the absence of controls, the lack of information on prior treatment and the study's reliance on subjective assessments of symptoms (i.e. asking patients if the drug had made them feel any better). Overall, the trials in California saw no statistically significant effect on survival from hydrazine sulfate treatment, but noted increased calorie intake in treated patients versus controls. The authors also performed a post-hoc analysis on one or more subgroups of these patients, which they reported as suggesting a beneficial effect from treatment. The design and interpretation of this trial, and in particular the validity of this subgroup analysis, was criticized in detail in an editorial in the Journal of Clinical Oncology. Later randomized controlled trials trials failed to find any improvement in survival, For example, in a trial of the treatment of advanced lung cancer, with either cisplatin and vinblastine or these drugs plus hydrazine sulfate, saw complete tumor regression in 4% of the hydrazine group, versus 3% in the control group, and tumor progression in 36% of the hydrazine group, versus 30% of the control group; however, none of these differences were statistically significant. Some trials even found both significantly decreased survival and significantly poorer quality of life in those patients receiving hydrazine sulfate. These consistently negative results have resulted in hydrazine sulfate being described as a "disproven cancer therapy" in a recent medical review. Similarly, other reviews have concluded that there is "strong evidence" against the use of hydrazine sulfate to treat anorexia or weight loss in cancer patients. 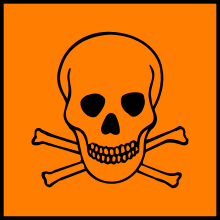 Hydrazine sulfate is toxic and carcinogenic. Nevertheless, the short-term side effects reported in various clinical trials are relatively mild: minor nausea and vomiting, dizziness and excitement, polyneuritis (inflammation of the nerves) and difficulties in fine muscle control (such as writing). However, more serious, even fatal side effects have been reported in rare cases: one patient developed fatal liver and kidney failure, and another developed serious symptoms of neurotoxicity. These side effects and other reports of hydrazine toxicity are consistent with the hypothesis that hydrazine may play a role in the toxicity of the antibiotic isoniazid, which is thought to be metabolized to hydrazine in the body. Hydrazine sulfate is also a monoamine oxidase inhibitor (MAOI), and is incompatible with alcohol, tranquilizers and sleeping pills (benzodiazepines and barbiturates), and other psycho-active drugs, with pethidine (meperidine, Demerol), and with foods containing significant amounts of the amino acid breakdown product tyramine, such as aged cheeses, raisins, avocados, processed and cured fish and meats, fermented products, and others. 1 2 Milne, George W. A. (2005). Gardner's commercially important chemicals: synonyms, trade names, and properties. New York: Wiley-Interscience. pp. 325. ISBN 0-471-73518-3. ↑ Chlebowski, R. T.; Bulcavage, L.; Grosvenor, M.; et al. (1987), "Hydrazine Sulfate in Cancer Patients With Weight Loss. A Placebo-Controlled Clinical Experience", Cancer, 59 (3): 406–10, doi:10.1002/1097-0142(19870201)59:3<406::AID-CNCR2820590309>3.0.CO;2-W, PMID 3791153 . ↑ Brauer, M.; Inculet, R. I.; Bratnager, G.; Marsh, G. D.; Driedger, A. A.; Thompson, R. T. (1994), "Insulin Protects against Hepatic Bioenergetic Deterioration by Cancer Cachexia. An in-Vivo 31P Magnetic Resonance Study", Cancer Research, 54 (24): 6383–86, PMID 7987832 . ↑ Chlebowski, R. T.; Bulcavage, L.; Grosvenor, M.; Oktay, E.; Block, J. B.; Chlebowski, J. S.; Ali, I.; Elashoff, R. (1990), "Hydrazine Sulfate Influence on Nutritional Status and Survival in Non-Small-Cell Lung Cancer", Journal of Clinical Oncology, 8 (8): 9–15, PMID 1688616 . ↑ Gold, J. (1999), "Long term complete response in patient with advanced, localized NSCLC with hydrazine sulfate, radiation and Carboplatin, refractory to combination chemotherapy", Proceedings of the American Association for Cancer Research (40): 642 . Abstract. 1 2 3 Black, M.; Hussain, H. (2000), "Hydrazine, Cancer, the Internet, Isoniazid, and the Liver" (PDF), Annals of Internal Medicine, 133 (11): 911–13, doi:10.7326/0003-4819-133-11-200012050-00016, PMID 11103062 . Null, Gary; Robert Houston (1979). "The Great Cancer Fraud". Penthouse: 76–78, 82, 268, 270, 272, 274, 276–278. Null, Gary; A. Pitrone (1980). "Suppression of new cancer therapies: Dr. Joseph Gold and hydrazine sulfate". Penthouse: 97–98, 160, 162–163. Null, Gary; L. Steinman (1980). "The politics of cancer. Part five. Suppression of new cancer therapies: Dr. Lawrence Burton". Penthouse: 75–76, 188–194, 196–197. ↑ Goldberg, Burton; Trivieri, Larry; Anderson, John W., eds. (2002), Alternative medicine: the definitive guide (2nd ed. ), Celestial Arts, pp. 50–51, 598, ISBN 1-58761-141-4 . ↑ Jenks, S. (1993), "Hydrazine Sulfate Ad Is "Offensive"", Journal of the National Cancer Institute, 85 (7): 528–29, doi:10.1093/jnci/85.7.528, PMID 8455198 . ↑ Nadel, M. V. (September 1995), "Cancer Drug Research—Contrary to Allegations, Hydrazine Sulfate Studies Were Not Flawed", Report to the Chairman and Ranking Minority Member, Human Resources and Intergovernmental Relations Subcommittee, House Committee on Government Reform and Oversight (PDF), Washington, D.C.: General Accounting Office, Document No. HEHS-95-141 . 1 2 3 4 Kaegi, Elizabeth (1998), "Unconventional therapies for cancer: 4. Hydrazine sulfate. Task Force on Alternative Therapies of the Canadian Breast Cancer Research Initiative", Canadian Medical Association Journal, 158 (10): 1327–30, PMC 1229327 , PMID 9614826 . ↑ Gold, J. (1968), "Proposed Treatment of Cancer by Inhibition of Gluconeogenesis", Oncology, 22 (2): 185–207, doi:10.1159/000224450, PMID 5688432 . ↑ Gold, J. (1974), "Cancer Cachexia and Gluconeogenesis", Annals of the New York Academy of Sciences, 230 (1 Paraneoplasti): 103–10, doi:10.1111/j.1749-6632.1974.tb14440.x, PMID 4522864 . 1 2 Filov, V. A.; Gershanovich, M. L.; Danova, L. A.; Ivin, B. A. (1995), "Experience of the Treatment with Sehydrin (Hydrazine Sulfate, HS) in the Advanced Cancer Patients", Investigational New Drugs, 13 (1): 89–97, doi:10.1007/BF02614227, PMID 7499115 . ↑ Hydrazine Hazard Summary, U.S. Environmental Protection Agency, January 2000 . ↑ Section 9.2.1, Environmental Health Criteria for Hydrazine, International Programme on Chemical Safety, 1987 . ↑ Hainer, M. I.; et al. (2000), "Fatal hepatorenal failure associated with hydrazine sulfate" (PDF), Annals of Internal Medicine, 133 (11): 877–80, doi:10.7326/0003-4819-133-11-200012050-00011, PMID 11103057 . ↑ Nagappan, R.; Riddell, T. (2000), "Pyridoxine therapy in a patient with severe hydrazine sulfate toxicity", Critical Care in Medicine, 28 (6): 2116–18, doi:10.1097/00003246-200006000-00076, PMID 10890675 .